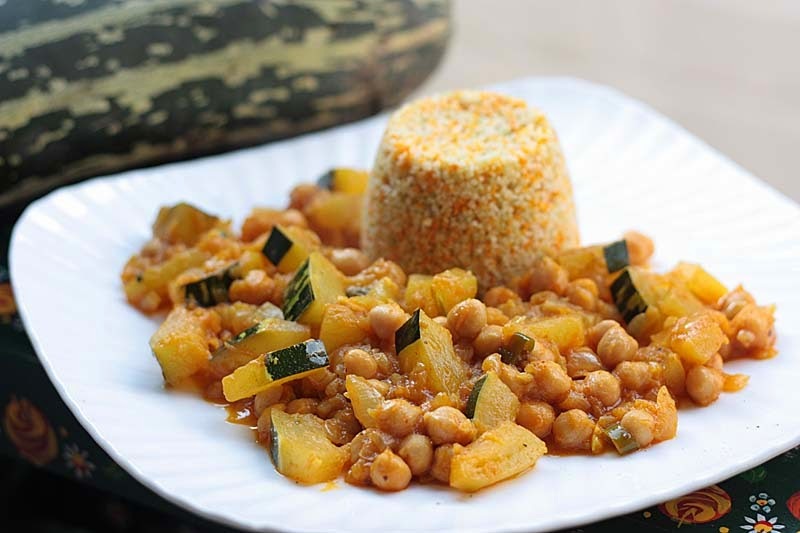 Some of you may remember the monster marrows that I harvested from my garden a couple of weeks back, well here is one recipe that I made with it - vegan Marrow Curry with Chickpeas. For me this dish shouts Autumn on a plate! I actually could not remember the last time that I cooked or ate marrow, I think it was in my student days when I stuffed it with brown rice and baked it (this was the mid 1990s, not 1960s by the way). I know, very old fashioned, but some times those are the recipes that are the best, but this time round South Asian curry spices were calling my name. I kept some of the marrow outer skin on, for colour and texture, but it was a not such a good idea as the outer skin was really tough, but fortunately enough it slid of the marrow easily. I have one more home-grown marrow to go, so expect another recipe in the next couple of weeks. Oh for a change, I served it with Artisan Grains Tricolour Couscous. made up of golden couscous, tomato and spinach infused couscous. It was delicately flavoured. I have to say, it made a pleasant change from plain Basmati rice. Another option is to stir the two together, I did with the left overs and it made for easy lunching! In a large wide pan, heat the oil then add the minced onions, garlic and ginger and cook until transparent, add the spices and cook until the oil rises to the surface. Add the tomato paste and stir in the chopped marrow pieces and cook until the marrow is beginning to soften, but still has some bite. Keep stirring to stop the sauce and vegetables from sticking to the pan, when the marrow is cooked, stir in the chickpeas. Cook for a few more minutes more and serve it as a thick dry curry. 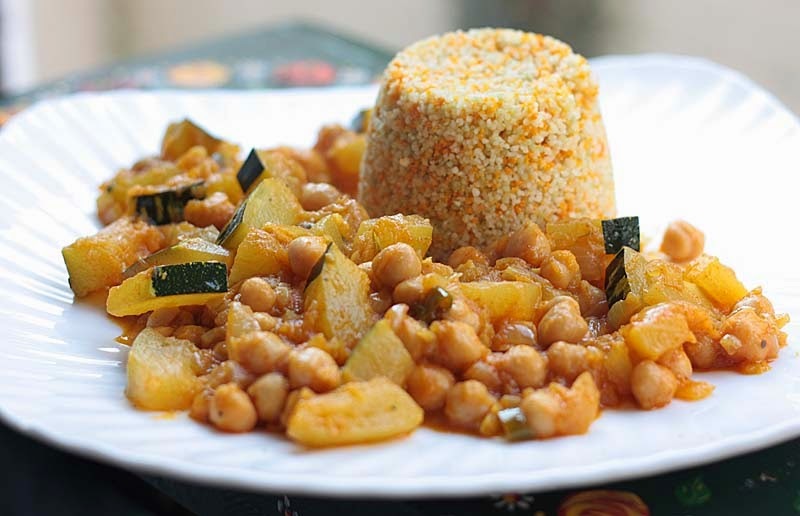 Serve with rice and garnish with a little sprinkling of garam masala. I think that dish needs a bit of red chilli in it to give it extra colour (and heat)! There are two chillies in there, but I think they may have been green rather than red, a little red would have def. been welcome, but sometimes its nice to have a mild curry. Really like the sound of this recipe. Looks very good! Thank you so much. It was hearty. A really good idea to use marrow in a curry! I might try this. Thank you VegHog. I have another recipe to share which I hope you will like too, but It may be a week or so before I blog about that.